The service level was excellent. I loved my stay at this hotel. 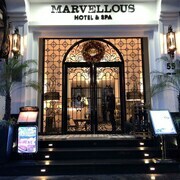 This hotel is not new but looking good.Our room was clean and nice decorate with enough travel amenities.Good location and nice people in Hanoi.Overall,good hotel to stay . 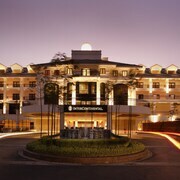 Which hotels are closest to the Hanoi airport? 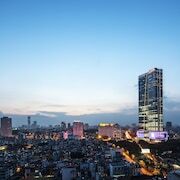 Can you find accommodation in popular areas of Hanoi? Where to stay near top Hanoi attractions? What kind of hotels are in Hanoi? 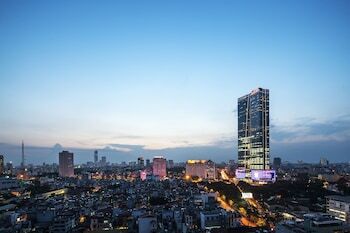 Which hotel chains are in Hanoi? History buffs will enjoy exploring Hanoi, and visitors give high marks for the lakeside setting, local tours, and fascinating museums. Culturally-rich and welcoming, this city will delight tourists with its cafés, shopping, and restaurants. Top sights in the city include Ho Chi Minh Mausoleum, Temple of Literature, and Thang Long Water Puppet Theatre. Well known for its museums, the city's cultural venues include Thang Long Water Puppet Theatre, Historical Military Museum, and Vietnam Military History Museum. The city is notable for its historic sites and landmarks like Ho Chi Minh Mausoleum, Temple of Literature, and Hanoi Citadel. The city's natural setting is picturesque, including the lakeside and Hoan Kiem Lake. 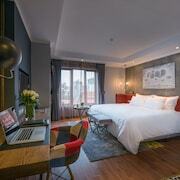 Splendid Hotel & Spa - This 3-star hotel in Hoan Kiem features a restaurant, free WiFi, and a computer station. It's a favorite with Expedia travelers for its breakfast and overall value. 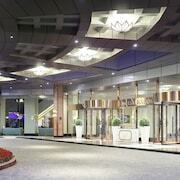 Hanoi Allure Hotel - Our customers like the helpful staff and clean rooms at this hotel. 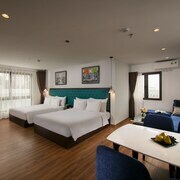 Guests who stay at this 3.5-star hotel in Hoan Kiem can enjoy access to a restaurant and a bar, along with free WiFi. If you want to journey outside of the area, ride aboard a train from Hanoi Long Bien Station, Hanoi Railway Station, or Hanoi Gia Lam Station. Hanoi might not have many public transit options to choose from so consider a car rental to maximize your time. Are you looking for a new place to visit in Southeast Asia? Fly to Hanoi, where you can get lost in the ancient history of a city that has been Vietnam’s capital for 1,000 years. While here, you can explore museums and temples, peaceful parks, and numerous events. Go on a food tour or take part in a cooking class to discover local delicacies. Visit one of many theatre shows showcasing Vietnamese culture, or go shopping and strike a bargain at the local markets. Whatever you do, you will bring back fascinating memories from a city that effortlessly combines ancient Sino-Vietnamese tradition with French flair. 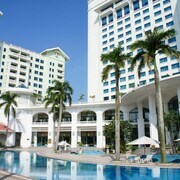 There are many hotels in Hanoi in every price category. Plenty of cheap hostels and guesthouses are located in the Old Quarter. 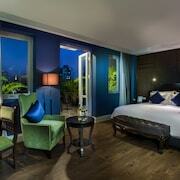 The Hoan Kiem district also offers a large selection of boutique hotels for the discerning visitor. 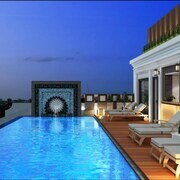 If you feel like splurging, there are several 5-star-hotels located in or close to the business district. Hanoi’s climate is tropical and wet. It can get very hot and steamy in summer, so avoid travelling between June and August if sweltering heat is not for you. In winter temperatures drop significantly, and it can become windy. Expect average temperatures of 20 degrees Celsius between December and February. Hanoi accommodation is best booked ahead, and Expedia.com.au is here to get you the top rates on the hotel of your choice. When you book through us, you’ll find exactly the amenities you want at a price you can afford. Reserve your room with us and start planning your Hanoi activities today. 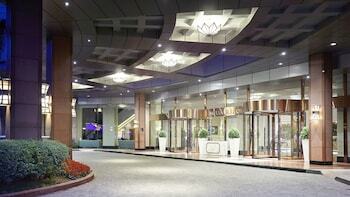 What are the most popular hotels in Hanoi? 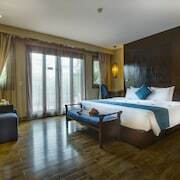 Are there hotels in cities near Hanoi? 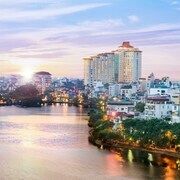 Explore Hanoi with Expedia.com.au’s Travel Guides to find the best flights, cars, holiday packages and more!